Doubt, for me, begins as a quiet thought in my mind, but in no time can turn into a roaring waterfall if I don’t address it immediately. I would be lying if I said I never doubted our decision to homeschool our kids. Though it is not something I constantly battle with, I find that it still manages to rear its ugly head on occasion. Have you ever struggled with doubting your decision to homeschool? Maybe we can help each other out! My husband and I both went to public school. I would argue that, for the most part, we both liked going to public school. He was involved in sports and I was an over-achiever academically, both things the school system smiles upon. We fit in. We had friends. The teachers liked us. When I start to think of our experiences in public school, sometimes my mind sees all of the things that I enjoyed about school, and I can’t help but feel that I am taking these experiences away from my kids. Thus, the doubt starts to creep in. Doubt can be triggered by an external source as well. Just last week, my niece, who is in public school and the same grade as our homeschooled son, sat down and read two books to me. She whizzed through the books, no problem, reading words that we haven’t even touched yet at our house. One of my mantras in homeschooling has been “don’t compare”. Yet, what do you think I found myself doing as my niece sat there flying through her reading books? A few days later, my dad asked my husband if we were planning on putting our kids in public school someday, because he worries about the social aspect of homeschooling. Now, let me explain that my husband and I have learned to grow thick skin to peoples’ comments since starting our homeschooling journey, but this is the first time MY dad has really made any comments, either positive or negative, about our decision to homeschool. And for the reason, it has been a hard comment for me to shake. It’s easy to say, “I don’t care what people think,” but it’s much harder to live it out. Especially when it comes from a family member, whom I love and respect. 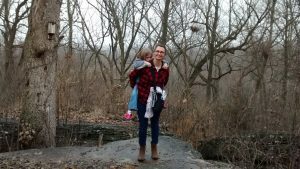 Needless to say, this past week has been one of those mental struggles for me, asking hard questions to myself and getting back to the basics of why we are homeschooling. When it comes down to it, I realize that the doubt I am feeling is stemming from fear. Fear of the unknown. Fear of “I’ve never done this before.” Fear of “No one in my family has done this before.” Fear of what other people think. And mostly, the fear that my children are paying some type of price for it all. Maybe you struggle with some of these same thoughts from time to time. I’ve found the best way to start thinking clearly again is to take on each fear directly. “I’ve never done this before.” So what? There are lots of things I’ve never done before that I haven’t been afraid to do. Why should homeschooling be one of them? I have the desire to teach my kids, and to do a great job, and I won’t settle for less. “What do other people think?” This might be a mental battle the rest of my homeschooling life, but there are so many things in life that we don’t allow what other people think control our decisions. I just need to get over the fact that people will always have their opinions, their comments, but it will not dictate our family’s lifestyle. “Are my kids paying a price?” Are my kids missing out on a public school experience? Yes. But that isn’t necessarily a bad thing either. Are there good things about the public school system? Sure. I’m not so stubborn to argue otherwise. But it’s definitely not all good! We have decided that for our family, the good in homeschooling far outweighs the public school experience. For our family’s situation, we truly believe our kids would be “paying a price” in the public school system. But I definitely don’t look down on someone who chooses public school for their family. One of the best ways I’ve found to battle doubt when it creeps up is to reach out to other homeschoolers. I am blessed to have a close friend who has been homeschooling longer than we have. She is an awesome resource and helps me feel like I’m not alone. I also highly recommend joining HSLDA (I’m not affiliated with them and don’t get reimbursed in any way). Their weekly emails, articles, and newsletters are very encouraging and always point out the great successes that are found in homeschooling. Remember to remind yourself of your own personal successes in homeschooling. Look back at what you’ve done with your kids, the milestones they have reached, and you will have more confidence that, indeed, you are making the best choice! Success! 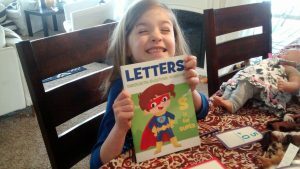 A finishes her Letters workbook. Don’t let doubt derail you! Thousands of people have gone through this before and come through the other side with success! It won’t be any different for you and I! What doubts have you had about homeschooling? What do you do to face it?